We will be baking cookies every weekend for this festive season. Please call on 9930358173 and come home….talk to us… help us talk to you. We love Lakshmi’s cookies. Everyday we ask Amma if it is Lakshmi’s cookie day. Lakshmi has worked very hard to learn to bake cookies. The cookie project is for Lakshmi a learning project to achieve something, to get thanks from somebody. People all over Mumbai will know that Lakshmi’s cookies are the best. East or West, Lakshmi’s cookies are the best. Lakshmi is very creative. We should thank Ms.Rinku for helping her. Her cookies are very tasty. People should know that Lakshmi has some talent. If Lakshmi’s cookie project is very successful, I will feel very happy. Whatever money we earn, we can give it to a charity company. 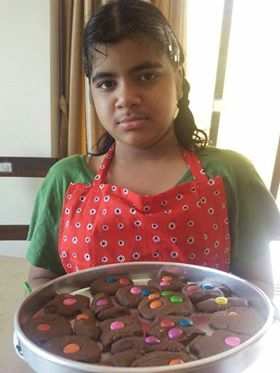 We will upload Lakshmi’s cookie video on You Tube so that others can learn to bake cookies from Lakshmi. I don’t want any fame. I only want friends. Plus I would like to see people eating my cookies. That would be a happy fame. It is a fun activity to decorate the boxes. I don’t feel somebody is forcing me to do something. Well done, together gang! Fantastic initiative! Look forward to seeing more photographs of all of you! Dear Krishna, Lakshmi, Jayanthi and Jayashree. Wishing you lots of luck in your new venture. Have fun too and don’t forget to make me a few cookies. Sneha is waiting to taste them too. Bring Sneha over here, Periamma when you send someone to take the cookies and she will have to stay here for at least three weeks. Awsome…… Amazing way to make them functional…..really impressed. Seema aunty, even Iam very excited to hear that you are excited. Do you also make cookies? If you do, we will eat your cookies and you can eat our cookies! To the Fantastic Four and their equally amazing parents – I am so happy and proud to see what you are up to! I am queueing up for the cookies and am sure many of us at Ummeed will. We will also wait for you to come and take the cookies and in fact, we will not even make you wait in the line even if you are last. My heart jumps with joy seeing this really happen!!! Heartfelt congratulations Sangeetha and Rinku – you dared to dream and have made it a reality. Laxmi has been a master chef from her past life and can’t wait to taste her cookies. And Jayanthi, our little master of peace am sure has added generous doses of calm into them. Congratulations to Krishna and Jayashree too, for being a part of this beautiful venture!! Way to go, guys, God be with you!! Thank you Ruchi aunty for congratulating us. We will give you 14 extra cookies, 7 extra for you and 7 extra for Arijeet. Please bring Arijeet here and you can have a stayover with us. Thank you Ruchi aunty for your comments. I am waiting for you to come and take your second batch of cookies. Hope Aru also liked the cookies. We will try to make more tasty cookies whenever you want.